Sisters with Stuff: Looks harmless right...don't be fooled! It looks harmless right, cute little pancake guy or girl walking on the sidewalk outside IHOP waving you to come in, don't let it fool you, it is out to get you and make your life miserable. I'll start at the beginning so you know what I'm talking and let me preface this by saying: If you have small kids you'll probably know exactly what I'm talking about, if not I would have to say, that your drinking at night after the kids are in bed has really affected your long term memory. If you have older kids you'll probably think "how dare she let her child act like that, we didn't let our kids get away with that kind of stuff" that's cool I respect your opinion but denial ain't just a river in Egypt, and if you don't have kids you'll probably think "I don't get it" (don't feel bad I didn't have my first child until I was 37 so I was childless for a long time and I would have thought the same thing) "I don't get it", so you may want to stop reading right now, if you decide to keep reading don't come back to me at the end and ask for the 5 wasted minutes of your life back cuz I can't do it. It all started fourscore and seven years ago, wait, not that far back, it was actually last week my 5 year old daughter came home from kindergarten and said we have to go to breakfast at the school tomorrow morning and eat pancakes with all the teachers, the PTA was throwing a teachers appreciation pancake breakfast and you could go to school "early" and join them for pancakes and that we have to go because she loves pancakes. To start with, no way was I getting up that early to go, second of all, I know my daughter and there is no way she would get up that early to go, I can barely drag her out of bed every morning to get to school on time, and third if she loves pancakes so much we can make them at home anytime, so I said no, not this time. You would think I had taken away her birthday, she cried and pleaded she said she wanted pancakes and if we didn't go she would never get pancakes again, eventually I couldn't stand it anymore and no matter what I said there was no consoling her so I sent her to her room and told her she could come out when she got control of herself. After a half an hour of crying she calmed down and came out to apologize, she asked me if we weren't going to go to the pancake breakfast, could we go to IHOP this weekend and get pancakes, I was completely surprised because we never go to IHOP and she doesn't usually watch TV that has commercials so I couldn't figure out how she knows about IHOP. I agreed, with the condition that she has to be on her best behavior the rest of the week, she took it very seriously and reminded me every day, many times a day that she was being good because she wanted pancakes, pancakes, pancakes. I couldn't wait for the weekend because she was driving me crazy with the pancake thing, finally we went on Saturday morning, she's very excited and they hand her the kids menu, I kid you not she takes one look at the menu and says I want macaroni & cheese! Seriously??? I about lost my mind, I looked at my husband and said she is getting pancakes if it's the last thing she ever eats!!! After all that, she wants the Kraft macaroni & cheese that she can have anytime at home, she drove me crazy for a week because she was obsessed with getting pancakes from IHOP. Well she got pancakes and loved them, but I still wracked my brain trying to figure out what this whole IHOP pancake thing was about, I texted a friend to tell her about it and she said it's that guy in the pancake suit that waves at you every time you drive by. The light bulb came on, I had an Oprah AHA moment, that was it, every time we drive by the pancake guy is out there waving you in and she always points him out, that pancake guy was reason I had to endure a meltdown, and enough pancake talk to drive me to drink (more), I want him gone, I want him disappeared if you know what I mean! 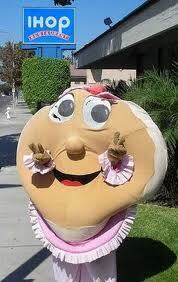 Harmless guy in a pancake suit...HA!